That’s the name of the talk I gave at MN Search yesterday. 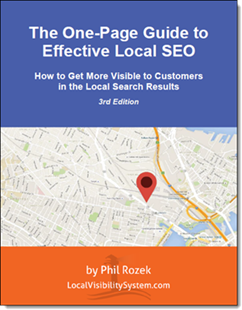 I covered 25 quick wins for attracting more local customers when you don’t know what to do next. Some of my suggestions are for local rankings, some for PPC, some for review strategy, and more. Thanks to Scott Dodge, Susan Staupe, Aaron Weiche, and everyone at MN Search for an incredible event. And thanks to Spyder Trap for hosting it. Especially if you’re in the area, GO to their next event. You’ll learn plenty, and get to know some great people. Hey Phil, love that you specifically pointed out Meetup. It’s probably the strongest backlink I have for my own marketing agency domain since I never did a backlink campaign. I did a quick Tampa search and found a local moms group that has been meeting for 2 years and has 125 members. They also collect dues to cover group fees and occassional events. That seems like a decent group to reach out to for a few of my clients. Have you found that a a meetup group has to be in existence for X years before it has a good follow link? How much do you think is a respectable cash amount to offer the Meetup organizer? Hey Tony, good questions. I believe the “Sponsors” page of every Meetup.com group has a follow link. I haven’t noticed any variation in link juice (in this case Page Authority) between them – but I haven’t looked hard. I’d say $200 is a solid amount. Great tips Phil. I have never done the Meetup sponsors before. Is this processed through the website itself? I think it would be a better deal to offer pro-bono service (like flier design or building a website for the event and hosting it) in exchange for the sponsor title. You can possibly get reviews for the service offered too this way. Nope, you’d just contact the group’s organizer. I agree that if you have a service the group could use it might be better to donate services rather than money. Very great presentation there! I definitely agree that online marketing needs to be a launch pad. Some people think that creating a website is the end of it, but you have to get your work out there and learn how to market using your website as a TOOL!